This is my great granddaddy. We called him Daddy Pop. His name was William Harry Griffin B.12-14-1870 D. 03-05-1962. His Burial was at the Mason Cemetery, Arp Texas. 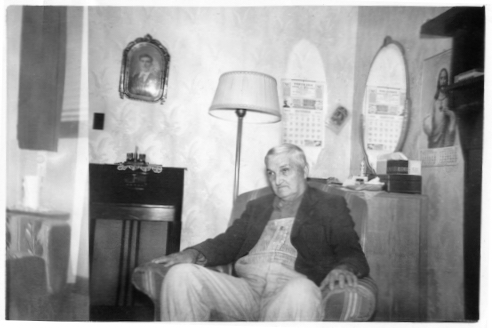 The Memorial Obituary was: W. H. Griffin - Overton,Texas Services will be held at 2 pm wednesday for william Harry griffin 91, a resident of Overton for the pass 85 years. Mr. Griffin died Monday in Houston following a lengthy illness. He was visiting a daughter, Mrs. Dell Paterson, at the time of his death. Rev. Odom Dyess, pastor of the First Baptist Churdh, Overton, will conduct the services in the Pearson Funeral Home Chapel. He will be assised by Rev. C.Frances, pastor of Overton's Mission Baptist Chruch. Burial will be in the Mason Cemetery, Arp Texas. Mr. Griffin is survived by one son. E.O. Griffin of Overton, four daughters, Mrs. Pearl Sparks of Henderson, Mrs. Vera Garrett and Mrs Paterson both of Houston, and Mrs Rosa Rauma of Renton, Washington. one sister Mrs. Ida Christian of Overton and several Grandchildren and great grandchildren.